My daughter loves to have tea parties. She invites Kitty, Bear, Flounder, and Baby (not quite original with the names yet). Of coarse I am invited as well and she insists that I call her "Princess Tea". My name is "just momma". We eat crackers that she collects from under the bed or sometimes just magically appear from thin air. We drink tea that pours out of the knobs on the dresser. Occasionally we have some apples freshly picked from the tree in the middle of her room. It is a rule that we must always clink cups and say "cheers" before we sip our tea. And story time is an integral part of our tea parties. These days she prefers to read silently to herself and no one can speak until she has finished "reading". My daughter is quite the princess! Very precious. Love the processing on this, it looks quite dreamy. I love this photo! Aren't little girls the best! Oh my--I really like this shot! Your pp on it is wonderful; it looks like something out of a storybook. so soft and beautifuL! this would be so pretty framed and hung in her roOM! This is just a perfect shot. I love how it really captures childhood at its best. Little girls are so divine. She has a great room too. Its so bright and beautiful. This is stinking adorable! I LOVE it. Great colors! Love the framing here! Awesome shot and processing. That is great! Love her princess hat! That processing is fabulous. Nice textures! The pretiest princess! Love the PP on this! How adorable. I love the whole set up. That is a cute story. And ohhh, she is sooo cute! Love the look of this and how you processed it. What a life, huh! 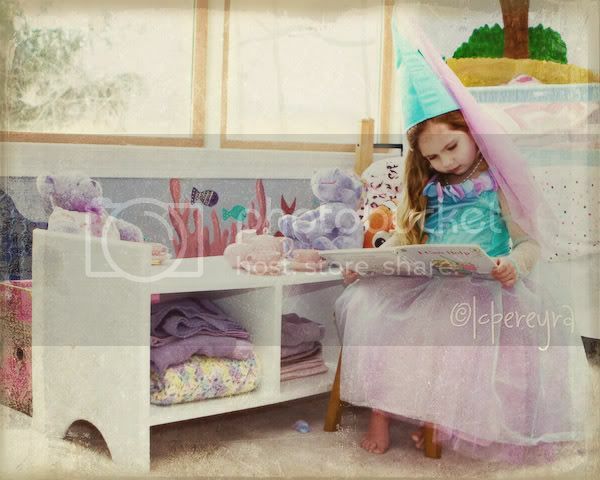 Reading in her princess cap has got to be every little girls dream. I just wanted to echo the comments of the others that I love the PP in this shot. She does look like a princess in a fairy tale! This is such an incredibly sweet picture, if it were me, I'd really be tempted to put it up on a canvas - BIG! I love the processing on this... what a great capture! This is so cute! I love her tea party and how lovely you described it, she is a princess. How precious, I love your processing! Oh my gosh. Love the photo but truly love that you shared the rules and regulations of the tea parties. What a perfect bit of childhood you have captured!